If the heat is on outdoors, follow these cool walking tips to make the most of your climate and maintain your walking routine. Know your local climate. Dawn is best, although it comes early in June and July. In some areas, a sea breeze begins cooling things down in mid-afternoon. But in many inland areas, the temperatures rise until early evening, 5 p.m. to 6 p.m., and do not cool off until sunset. Your after-work walk schedule may put you into the hottest time of day. 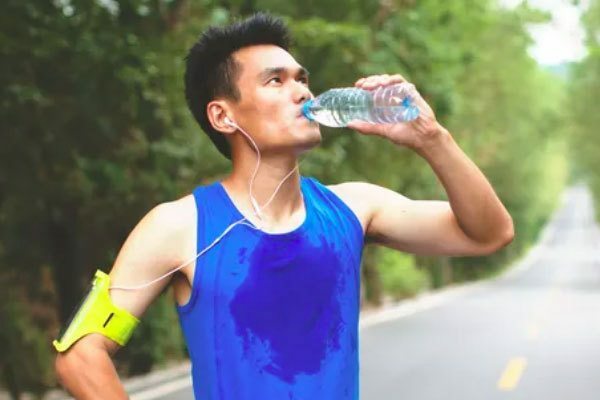 Think twice about exercising when the ambient temperature is above 90 F (32 C) and the relative humidity is above 60 percent, according to the American Council on Exercise. Check weather apps and sites for the heat index and use it to determine when it’s too hot to exercise outdoors. It’s best to do your walking workouts on the treadmill or an indoors walking track rather than risk unhealthy heat conditions. Avoid direct sun and walking on asphalt or concrete. Natural surface paths under the trees are the cooler places to walk. These are also favored by insects, so choose an insect repellent if they bug you too much, and check for ticks afterward. You can use the online mapping app to find a walking route and use the “Satellite View” or “Hybrid View” to see where the trees and shade may be. Drink a big glass of water (12 to 20 ounces) 60 minutes before you start your walk. That starts you off well-hydrated but you have a chance to eliminate any extra before you start walking. Then drink a cup of water (6 to 8 ounces) every 20 to 30 minutes along your walk. You can tell if you end up dehydrated after your walk if your pulse rate remains high and your urine is dark yellow. The drinking guidelines for walkers and runners say to “drink when thirsty,” so be sure to carry water along so you can do so as soon as you are thirsty. Avoid drinks with a high sugar concentration, as that can cause nausea. Water is the best drink when walking for up to an hour. If you are walking and sweating for more than an hour, switch after the first hour to a sports drink that replaces electrolytes (body salt). Start with plenty of ice in your water so it stays cooler during your walk. Look for insulated water bottles and hydration packs. Your hot-weather walking gear should include light-colored clothing that is rated for shielding you from the sun’s ultraviolet rays. While you may think less clothing will be cooler, note that people who walk in the desert keep their skin covered with loose, lightweight clothing. Wear a hat with a visor or a desert cap with flaps to shade your neck. Wear sunscreen to prevent sunburn, skin cancer, and wrinkles. Wear sunglasses that filter UVA and UVB to protect your eyes. Look for magic cooling bandannas that have crystals that swell with water and keep your neck cool for a long time. You can also dampen and freeze a bandanna or washcloth and keep it in a ziplock bag with ice cubes, even carrying it in an insulated carrier in a backpack. Place it around your neck for a quick cooldown. Splashing your face and neck with cool water can help you cool down. During your walk, you can soak your hat in water at a water fountain to help keep you cool. If you wear sweatbands on your wrists, soaking those in cool water can also help provide heat relief. If you can’t avoid the heat, lower the intensity of your walking workout so your body generates less internal heat. Slow down, especially when going uphill. Save the higher intensity workouts for cooler times. Also, note that if you are going from a cool climate to a warm one that you will feel the heat even at relatively cool temperatures. If you are traveling, take this into account and plan easier workouts until you are used to the new climate. Monitor yourself and your walking companions for signs of heat sickness. If you become dizzy, nauseated, have dry skin or the chills, stop and try to get a drink of water or sports drink. If you do not feel better, get medical help immediately. If you are under care for a medical condition, especially heart or respiratory problems or have had heat stroke previously, consult with your health-care provider about walking in the heat. It is interesting to note that one research review of cooling strategies during exercise found that they helped exercisers keep going, but didn’t appear to actually reduce the internal body temperature. You may still be at risk for heat sickness even if you don’t feel hot. Keep that in mind and stay safe. This article came from www.verywellfit.com. Our mission is to respectfully and compassionately meet the needs of our clients and their families by listening, planning, educating, and delivering the highest quality of individualized home health care.